Read the pressure using the graduations of the gauge. 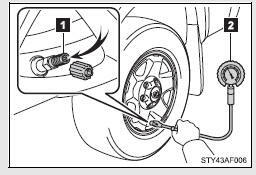 If the tire inflation pressure is not within the recommended levels, adjust inflate the tire. You should check tire pressure every two weeks, or at least once a month. When checking tire inflation pressure, observe the following: ●Check only when the tires are cold. If your vehicle has been parked for at least 3 hours and has not been driven for more than 1 mile or 1.5 km, you will get an accurate cold tire inflation pressure reading. ●Do not bleed or reduce tire inflation pressure after driving. It is normal for the tire inflation pressure to be higher after driving. Otherwise, the following conditions may occur and result in an accident causing death or serious injury.